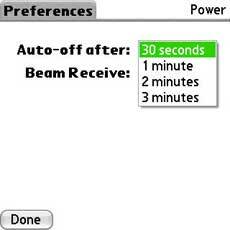 In order to save battery life our Treo switches off automatically after either 30 seconds and up to 3 minutes (below left). In principle this is great but in a few situations such as when you’re using either a Wireless Keyboard or GPS navigation unit where you need to have your Treo turned on for longer periods of time or with Enfora’s WiFi Adapter which powers off and closes the connection every time your Treo is turned off you will prefer to set the Auto-Off timer past just 3 minutes. As is invariably the case whenever there’s an issue that Palm or PalmSource have not accounted for there will be a resourceful developer who will step in to deliver a solution. 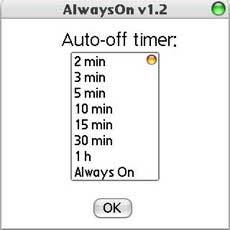 In this particular case I came across a free application called AlwaysOn (above right) which replaces the standard Auto-Off function and allows you to set its timing to anything from as short as 10 seconds to as long as 1 hour or even leave it at Always On. Since I use a wireless keyboard, TomTom GPS Navigator as well as the Enfora WiFi Adapter I have found AlwaysOn to be absolutely essential in saving me from the hassle of repeatedly turning my Treo on. Even if you don’t yet use a keyboard, GPS or the adapter and as long as you have enabled Auto-Keyguard (Prefs > Keyguard) there is no reason that you couldn’t use AlwaysOn and then simply turn off your Treo with the red Power Off button. I've used AlwaysOn on various Palm OS devices for years. It works fine and it's free. But after a firmware upgrade on my Cingular Treo 650, it stopped working, so I switched to AutoOff. it's a gr8 utility and i've been using it for quite some time now. i use zlauncher and i have placed this app in my top bar... very convenient that way. I have the same problem with the new Cingular Treo650 update 1.15. it set the treo to turn the screen off after 30-sec. no matter what you set the auto-off setting as. does anyone have a workaround? I have a Sprint 650 w/ all the updates and "AlwaysOn" dosen't work. I really like the idea of that control. Does anyone know if there is a similar Freeware ap?? Or one thats not expensive?? I have the same problem. What I've noticed is that the Cingular 1.15 update causes the default timeout to be reset to 30 seconds after every reset of the Treo. It drives me nuts, but I thought I was the only one until I came across this thread. The only semi-workaround is to reset the timeout manually after a reset occurs, but given how many times the Treo resets, it's a major annoyance to have to keep changing the timeout time, to say the least.